Open Burn is a up-and-coming heavy/power metal band that has been active since 2015. 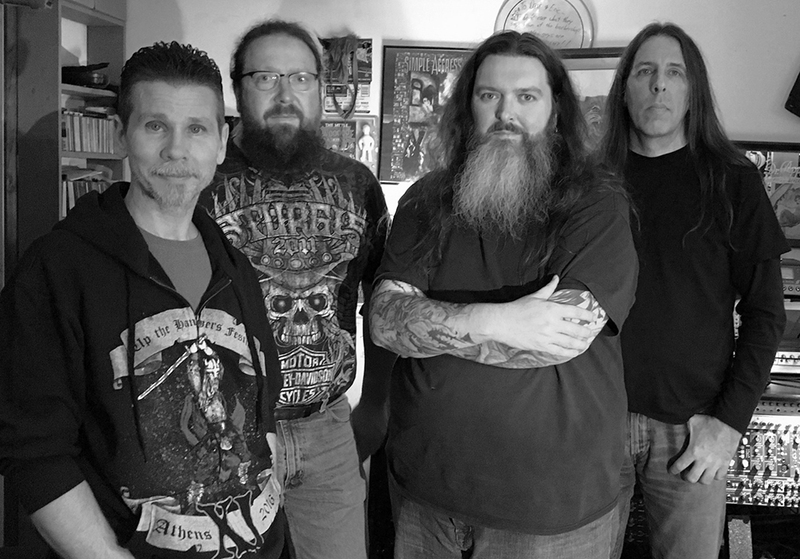 The group is compromised of Eric W. Johns (vocals), Dell Hull (guitars), Glen Cook (bass), and drummer Jerry Hartman. On April 25th I covered the band's (highly-recommended!) debut EP (link) and now it is my pleasure to present this follow-up interview. I would like to thank the members of Open Burn for taking time out of their busy schedules to sit and talk with us today. Andy-Open Burn is a new band with some familiar faces. Would you mind telling us how it all came about? Jerry-Dell, Eric and I all hooked up at a outdoor Bar-B-Q. We were drinking and enjoying some live music when we tossed the idea around of jamming together. The rest is the outcome of that evening. Glen-The other guys hooked up and had written most of what is on the EP before I joined in to record. Andy- How did you get hooked up with vocalist Eric Johns? Glen-Eric and I had been in a band together for several years when he happened to meet up with Dell and Jerry and started what was to become Open Burn. Jerry-Eric has been a part of the local music seen here in the Cincinnati area for a long time and we run around with a lot of the same friends. We all had time and decided it was a good idea to get together and write some tunes. Andy-Your debut EP came out in late January. How has the response been from everyone? Glen-So far the response has been very positive. Lethal fans have been supportive and it seems a lot of other people like the music as well.Jerry: For me it's been very well received. New and old fans, friends and family all enjoy the new material. Dell-Yes, it has been pretty well received so far and we have really only had a very limited reach to this point. Like Glen and Jerry said, not only are we getting a good response from Lethal fans but we also seem to be gaining new fans as well, particularly in Europe. Andy-The CD version of your new EP is all sold out. Do you have any plans to print up more copies of it? Dell-That is actually in the works. For now we are doing another reprint of the same disc format but are considering a few options for having the CD reprinted on a wider scale with jewel case, an additional booklet, lyrics, etc.. If that happens we will discontinue the original disc once they are all sold. Unfortunately there was an issue with the printers on the reprint or it would have already been on sale by now. Andy-Has Open Burn played out at all since forming? Glen-We had planned to play some shows this spring but life sets the agenda so that has not happened yet. We are looking forward to hitting the stage soon. Dell-Hopefully soon! We are mainly focusing on writing new material and getting our debut EP out there but we would love to play live as soon. Andy-When you do play live will you be performing only original compositions or will you throw in a cover or two? Glen-I've never been very interested in playing cover tunes but I'm not opposed to reworking a cool song. Mostly I would rather make original music. Dell-I agree. I feel like playing a cover song is almost like repainting someone else’s artwork but I’m not opposed to it as long as it’s done in our personal styles. We have done a couple in the past but they were really done as filler. Jerry-I do enjoy playing our original music more than covers. That being said I do like playing all kinds of music including cover tunes. When you get to see Open Burn live I would expect to hear our originals but you never know, we could always throw in something surprising. Eric-I don't mind playing a cover if we can make it our own. I guess it boils down to finding a song we could all agree on. Andy-What are your influences? Individually and band-wise? Glen-I find inspiration everywhere but from a bass player perspective it would be Steve Harris (Iron Maiden) and Geezer Butler (Black Sabbath). Dell-Like Glen said, influences can come from anywhere. Whether it’s something you like or something you don’t like it’s still influencing you. My personal favorites have always been The Beatles, Led Zeppelin and Iron Maiden, as the top 3. Eric-When I was young and just starting out, my influences were all of the all time great metal singers: Dio, Bruce Dickinson, Geoff Tate, Rob Halford, to name a few. My first favorite singer, though, was Roger Daltrey. I still listen to the Who's "Next" album all the time. As I got older, I discovered lots of other kinds of music and lots of other great singers. There's a lot more to singing than hitting the high notes and the power notes. Ultimately, it's all about telling a story that people can relate to and feel. Jerry-I've always enjoyed a wide variety of music and still do. The bands that really made me want to play music are the standards for metal in my opinion. Black Sabbath, Led Zeppelin, Deep Purple and Iron Maiden. Andy-You have a full-length album in the works right? Glen-We are working on new material. Initially we wanted to round out a good set of music to play live but of course a new recording is the ultimate goal. Whether that is a full-length album I suppose depends on the circumstances. Trying to self-produce a full-length album is very time consuming and fatiguing. If we have a lot of support to do that it's worth the burden but left to our own devices we may just record another EP to get new music out quicker. Andy-Do you have any new song titles that you would like to share? Eric-There are two songs that are pretty much finished. The first is called "Seven Orchids". I got the idea from reading about the rituals used to canonize Saints (most of which were martyred) in the middle ages. The second is called "Dissection Lullaby". The title was inspired by my 9th grade biology class. The teacher would play classical music anytime the students were assigned to dissect animals. She claimed it was calming and helped students focus on the assignment. It just thought it was odd to hear Brahmn's Lullaby while I'm cutting apart some poor unfortunate creature and smelling formaldehyde. Andy-Where can our readers find out more about your band? Dell-We try to keep our Facebook page up to date first but you can also check our pages on bandcamp, Reverbnation, CD Baby or our YouTube channel. Andy-How are you guys able to find time for both projects? Glen-Lethal has not been very active so there are no timing conflicts between the bands. Mostly for me it is just finding enough time between family and work to make music in general. Dell-It hasn’t been an issue so far. Jerry-For me whenever I can get together with either band I do what I can to make it happen. All these guys are my friends, family and brothers in music. Andy-I'd like to thank you for stopping by and talking with us. Any last thoughts? Glen-It's been good chatting with you Andy. We appreciate this opportunity to share some thoughts and provide a little insight into our band. Dell-Anytime Andy. We really appreciate your support. Stay tuned, there’s more on the way! Jerry-As always I'd like to thank everyone for checking out our new tunes and for all your support. Cheers!